﻿I've never actually held one in my hands, but I have seen it sell online for more than $100! That's just the pattern folks. You can't tell but I'm smizing! People even pay big bucks for this knock off pattern (I got mine for 99 cents!)﻿. Same collar, same cuffs, maybe a skinnier belt and slightly more flared skirt but that's about it. I think it could probably pass. Not as a real DVF of course, but maybe of a DVF pattern??? Oh girl you look fierce! I too love ANTM! The dress looks like the original. I look in all the thrift stores for the DVF version, just to frame it. But so far, no luck. I think I have paid over $30.00 for a Vogue before I found out about Club BMV. The independent pattern designers are pricey too. 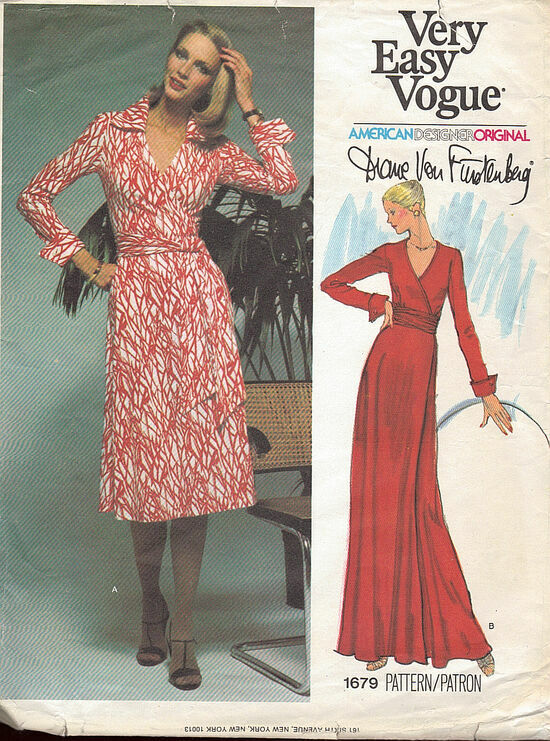 Wow, I didn't even know DVF had ever made sewing patterns. I love her dresses though, it just goes to show what great classic style she has that they're just as fashionable now as they were in the 70's. But it definitely is an easy knockoff, so I wouldn't splurge on the pattern. The most I've spent is probably about $10 or $15. Sadly I think it was for a brand from a big box store that just didn't happen to be on sale that day. But that was a long time ago, and I wouldn't do it again. I always end up having to alter the patterns so much that it's almost not worth buying them in the first place -- easier to start from scratch! But I love your dress, you did a fabulous job! Really?!! This is super super cute! Great job whipping up this hot number! Oh your dress looks gorgeous. I personally wouldn't pay that much for a pattern when you can get pretty much the same design for so much less. Holy awesomeness...ok that doesn't make sense...but it's what I thought when I saw the vintage pattern and dress! Wow great dress!! I love the color and everything. I LOVE wrap dresses. I am like you I would never pay that much for a pattern. I think the most I have ever paid is $10. Yep, one hundred bucks is way too much for a pattern, but there are good alternatives to that one. I'm glad you found one. Your dress turned out great! Looks fabulous. I am so impressed with your sewing skills. Love that gorgeous burgundy colour on you!! Love, love, love this dress! I have a vintage DVF dress that is my absolute prized possession and I only wear it when I seriously need luck on my side. Thank-you so much for joining up to our Pin'Inspiration Thursday Party. You have helped to make it a real success! I love your dress, very pretty. I would love for you to share your talents at Bacon Time, linky is Friday-monday. Wow! That dress is really lovely and you look great in it! Your dress is fabulous and you look smashing in it! I need to ask my mom if she has any 70's patterns stashed away. 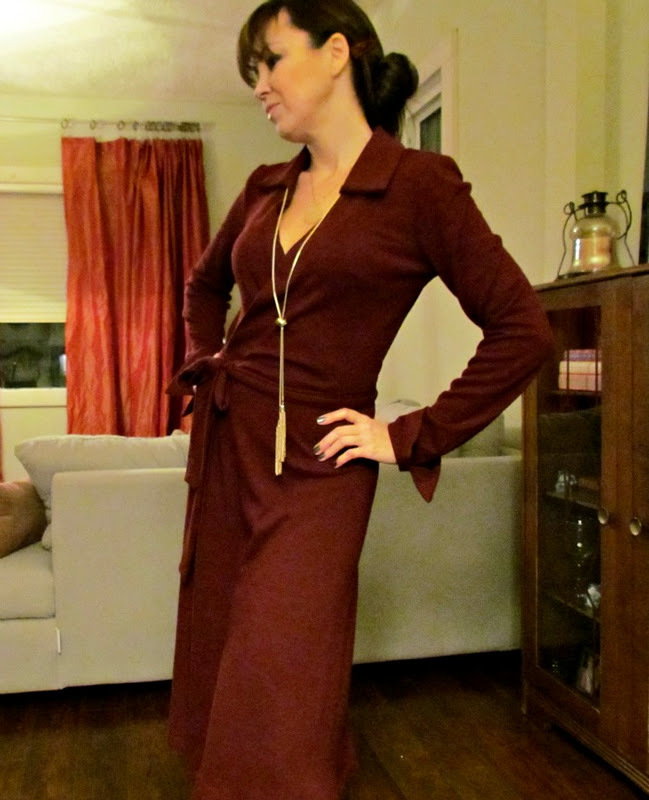 It would be fun to make a retro dress.